NFU Scotland has highlighted the importance of Scottish agriculture as an employer to an influential committee in Westminster on Wednesday 1st March 2017. 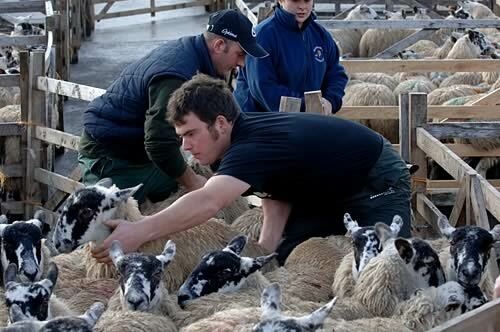 The Scottish agricultural workforce, including farmers, spouses, full time and part-time labour is more than 65,000. Crucially, employment further downstream in the Scottish food and drink sector is over 115,000. Giving evidence to the House of Commons Scottish Affairs Committee, as part of its inquiry into sustainable employment in Scotland, Vice President Gary Mitchell outlined the barriers, challenges and opportunities to sustainable employment in the agricultural sector. Mr Mitchell, who employs 14 people as part of his dairy farming enterprise at Galdenoch, near Stranraer, has been a keen supporter of initiatives to attract new entrants into the sector. Half the workforce on his farm are between 17 and 25 years of age. He is also currently supporting a pilot project in Dumfries and Galloway where school leavers with no previous farm experience are offered 12 week placements on local dairy farms. Working with other stakeholders, NFUS is keen to see the pilot rolled out to others sectors and all local authorities, with the goal of developing it into an integrated offering at all levels of the school curriculum from Rural Skills through to Foundation Apprenticeships. “Part of the beauty of Scottish agriculture is its diverse nature, made up of a hugely varied mix of farm types and farm sizes and where businesses will differ significantly in terms of the balance of inputs, outputs and income. “But almost all farmers are also employers, with staff working alongside them on a full, part-time or seasonal basis. Therefore, it is very important that governments work with the farming and crofting industry to ensure that all can access a reliable workforce beyond the help that they may already receive from their family. “There is work underway with Scottish Government to move opportunities for new entrants up the agenda but there is still so much more that can be done to overcome barriers to entry and attract talented people to agriculture. “NFUS is of the view that there is currently not enough encouragement or understanding at school level to recognise that farming offers a genuine career route. That is why the success of the Dumfries and Galloway dairy pilot, bringing S5 pupils on to farms a day a week, provides a model that other sectors and all education authorities could follow. “And the Union is also pressing hard to develop new apprenticeship schemes and routes to skills development and employment for young people entering our industry. “Looking further ahead, the challenge presented by Brexit is of significant concern to our industry. Food and drink production is the UK’s largest manufacturing sector, bigger than the automotive and aerospace sectors combined, but primary production is its cornerstone. That merits future agricultural workforce considerations being made a priority. “In addition, at any one time, there are between 5000 and 15,000 seasonal workers employed in the Scottish agricultural sector. Not only are non-UK staff essential to virtually all Scottish fruit and vegetable businesses but many more non-UK staff are a crucial part of the very successful Scottish food processing industry.